It’s GAME DAY and after the cheesy, spicy goodness of dips, pizzas and such, a little sweetness is just what’s wanted. 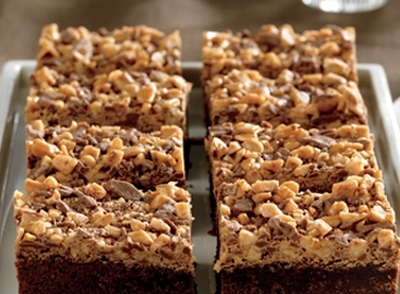 I give you the one – the only – Heath Bar Brownies. With a combination of crunchy toffee pieces and rich chocolate, this sweet little delight offers the perfect ending to any party. 1 family size box of brownies (the size that makes a 9×13 pan worth). Any variety, I buy store brand because it’s cheaper! 1 package of Heath Bar (or Skor) pieces. Prepare the brownies as directed on the package and pour into a greased 9×13 pan. Next, spread the Heath Bar/Skor pieces over the top of the (unbaked) batter and press down lightly. Cook as directed. Cool about 1 hour; cut into squares and serve. These travel great, freeze well but .. we’ve never had any left to freeze. So unless I make then when no one is around there’s not a chance they’ll see the inside of my freezer. P.S. You don’t have to reserve these to 1 x a year. Au contraire my friends; I’ve brought Heath Bar Brownies to baby showers, anniversary parties, tailgaters, picnics, funerals and girlfriends in need of a good friend, a good cry and some chocolate to lean on. Oh, I LOVE an easy recipe! Am definitely picking up some toffee bits and brownie mix on my next grocery store outing. I’m forever collecting brownie recipes, always looking for the ultimate. This looks like it could be a contender! Thanks for sharing! I think you’ll find this one is .. I go back to it b/c it’s easy, yummy and always a hit! Thanks for visiting, Sheila 🙂 MJ.